Seasonally switching up your bedding is a great way to not only keep cool, but also give your room a fresh look. Do yourself a favor and stash away your flannel and fleece blankets from the winter, and purchase yourself a set of nice and new cotton sheets. Bed linens made of lightweight cotton are known to be more breathable, and perfect for promoting airflow in the bedroom. Take a look at this Sheet Buying Guide for tips on what to look for when buying the sheets that will keep you cool even through the most humid and muggy summer nights. These fresh fruit and yogurt ice pops are three things. One, they are nutritious and delicious. Two, they’ll cure your boredom on a summer Saturday. Three, they’ll cool down your body temperature instantly. 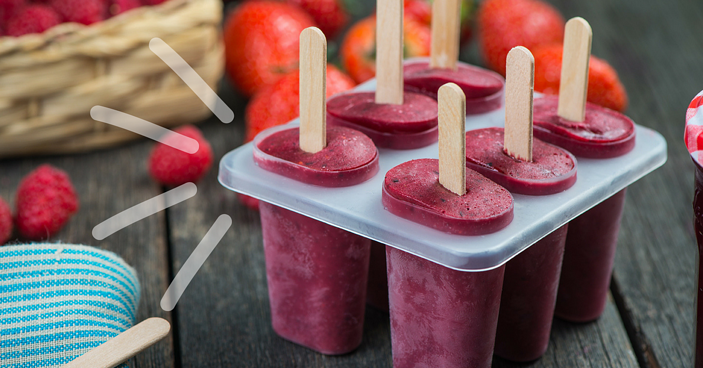 These ice pops only take 15 minutes to prep, and a few hours to freeze. We suggest making these in advance for when those hot days roll around, you can simply pull one out of the freezer and enjoy! We know, we know, you’ve been told so many times how important it is to drink water on hot summer days to stay hydrated, but have you ever thought about the importance of drinking a glass of H20 before bed? Tossing and turning dueto night sweats can result in major dehydration. Try drinking a glass before bed to avoid waking up in a sweat. We suggest sticking to just eight-ounces, unless you’re into late night bathroom runs. For more great tips, follow us on Facebook and keep reading our blog. We’re always sharing ways you can make the most of your apartment and community. Looking for a place to call home this summer? Oakleaf Property Managment would love to have you as a resident.